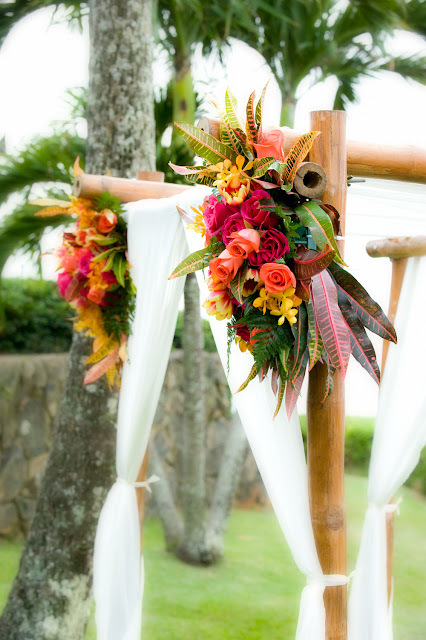 Our Maui wedding planners are always being asked about floral designs. We only use one designer and that's our good friends Della and Everett at Dellables. Della creates truly fantastic designs that our couples always love. There are plenty of choices, not just in flowers but in huppa arrangements, Haku Lei's, Bouquets, even Maile Ti Leis for the men. That's a two arrangement bamboo arch at Merriman's in Kapalua. We cut the arrangements off after the wedding and use them as a centerpiece for the dining table. Two uses for the price of one! There's an array of material available for the arch itself and the white fabric always adds a soft counterpoint to the bamboo. The couple typically stands in front of the arch which provides another adornment to the killer views at Merriman's.